A Consumer Price Index measures changes in the price level of market basket of consumer goods and services purchased by households. The CPI is a statistical estimate constructed using the prices of a sample of representative items whose prices are collected periodically. Sub-indices and sub-sub-indices are computed for different categories and sub-categories of goods and services, being combined to produce the overall index with weights reflecting their shares in the total of the consumer expenditures covered by the index. It is one of several price indices calculated by most national statistical agencies. The annual percentage change in a CPI is used as a measure of inflation. A CPI can be used to index (i.e. 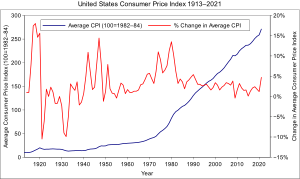 adjust for the effect of inflation) the real value of wages, salaries, pensions, for regulating prices and for deflating monetary magnitudes to show changes in real values. In most countries, the CPI, along with the population census, is one of the most closely watched national economic statistics. The index is usually computed monthly, or quarterly in some countries, as a weighted average of sub-indices for different components of consumer expenditure, such as food, housing, shoes, clothing, each of which is in turn a weighted average of sub-sub-indices. At the most detailed level, the elementary aggregate level, (for example, men's shirts sold in department stores in San Francisco), detailed weighting information is unavailable, so indices are computed using an unweighted arithmetic or geometric mean of the prices of the sampled product offers. (However, the growing use of scanner data is gradually making weighting information available even at the most detailed level.) These indices compare prices each month with prices in the price-reference month. The weights used to combine them into the higher-level aggregates, and then into the overall index, relate to the estimated expenditures during a preceding whole year of the consumers covered by the index on the products within its scope in the area covered. Thus the index is a fixed-weight index, but rarely a true Laspeyres index, since the weight-reference period of a year and the price-reference period, usually a more recent single month, do not coincide. Ideally, the weights would relate to the composition of expenditure during the time between the price-reference month and the current month. There is a large technical economics literature on index formulas which would approximate this and which can be shown to approximate what economic theorists call a true cost-of-living index. Such an index would show how consumer expenditure would have to move to compensate for price changes so as to allow consumers to maintain a constant standard of living. Approximations can only be computed retrospectively, whereas the index has to appear monthly and, preferably, quite soon. Nevertheless, in some countries, notably in the United States and Sweden, the philosophy of the index is that it is inspired by and approximates the notion of a true cost of living (constant utility) index, whereas in most of Europe it is regarded more pragmatically. The index reference period, usually called the base year, often differs both from the weight-reference period and the price-reference period. This is just a matter of rescaling the whole time-series to make the value for the index reference-period equal to 100. Annually revised weights are a desirable but expensive feature of an index, for the older the weights the greater is the divergence between the current expenditure pattern and that of the weight reference-period.
. The "updated cost" (i.e. the price of an item at a given year, e.g. : the price of bread in 2018) is divided by that of the initial year (the price of bread in 1970), then multiplied by one hundred. terms do not necessarily sum to 1 or 100. On the European Union's Harmonized Index of Consumer Prices (HICP), for example, each country computes some 80 prescribed sub-indices, their weighted average constituting the national HICP. The weights for these sub-indices will consist of the sum of the weights of a number of component lower level indices. The classification is according to use, developed in a national accounting context. This is not necessarily the kind of classification that is most appropriate for a consumer price index. Grouping together of substitutes or of products whose prices tend to move in parallel might be more suitable. Some of the elementary aggregate indices and some of the sub-indices can be defined simply in terms of the types of goods and/or services they cover. In the case of such products like newspapers in some countries and postal services, which have nationally uniform prices. But where price movements do differ or might differ between regions or between outlet types, separate regional and/or outlet-type elementary aggregates are ideally required for each detailed category of goods and services, each with its own weight. An example might be an elementary aggregate for sliced bread sold in supermarkets in the Northern region. The ideal, rarely realizable in practice, would consist of estimates of expenditure for each detailed consumption category, for each type of outlet, for each region. Household-expenditure surveys do not cover the expenditures of foreign visitors, though these may be within the scope of a consumer price index. Even with the necessary adjustments, the national-account estimates and household-expenditure surveys usually diverge. The statistical sources required for regional and outlet-type breakdowns are usually weak. Only a large-sample Household Expenditure survey can provide a regional breakdown. Regional population data are sometimes used for this purpose, but need adjustment to allow for regional differences in living standards and consumption patterns. Statistics of retail sales and market research reports can provide information for estimating outlet-type breakdowns, but the classifications they use rarely correspond to COICOP categories. The increasingly widespread use of bar codes, scanners in shops has meant that detailed cash register printed receipts are provided by shops for an increasing share of retail purchases. This development makes possible improved Household Expenditure surveys, as Statistics Iceland has demonstrated. Survey respondents keeping a diary of their purchases need to record only the total of purchases when itemized receipts were given to them and keep these receipts in a special pocket in the diary. These receipts provide not only a detailed breakdown of purchases but also the name of the outlet. Thus response burden is markedly reduced, accuracy is increased, product description is more specific and point of purchase data are obtained, facilitating the estimation of outlet-type weights. The way in which owner-occupied dwellings should be dealt with in a consumer price index has been, and remains, a subject of heated controversy in many countries. Various s have been considered, each with their advantages and disadvantages. Opportunity cost can be looked at in two ways, since there are two alternatives to continuing to live in an owner-occupied dwelling. One – supposing that it is one year's cost that is to be considered – is to sell it, earn interest on the owner's capital thus released, and buy it back a year later, making an allowance for its physical depreciation. This can be called the "alternative cost" approach. The other, the "rental equivalent" approach, is to let it to someone else for the year, in which case the cost is the rent that could be obtained for it. The merits of the different approaches are multidimensional, including feasibility, views on the way the index should and would move in particular circumstances, and theoretical properties of the index. Statisticians in a country lacking a good dwelling price index (which is required for all except the rental equivalent method) will go along with a proposal to use such an index only if they can obtain the necessary additional resources that will enable them to compile one. Even obtaining mortgage interest rate data can be a major task in a country with a multitude of mortgage lenders and many types of mortgage. Dislike of the effect upon the behavior of the consumer price index arising from the adoption of some methods can be a powerful, if sometimes unprincipled, argument. In the United States, several different consumer price indices are routinely computed by the Bureau of Labor Statistics (BLS). These include the CPI-U (for all urban consumers), CPI-W (for Urban Wage Earners and Clerical Workers), CPI-E (for the elderly), and C-CPI-U (chained CPI for all urban consumers). These are all built in two stages. First, the BLS collects data to estimate 8,018 separate item–area indices reflecting the prices of 211 categories of consumption items in 38 geographical areas. In the second stage, weighted averages are computed of these 8,018 item–area indices. The different indices differ only in the weights applied to the different 8,018 item–area indices. The weights for CPI-U and CPI-W are held constant for 24 months, changing in January of even-numbered years. The weights for C-CPI-U are updated each month to reflecting changes in consumption patterns in the last month. Thus, if people on average eat more chicken and less beef or more apples and fewer oranges than the previous month, that change would be reflected in next month's C-CPI-U. However, it would not be reflected in CPI-U and CPI-W until January of the next even-numbered year. In January of each year, Social Security recipients receive a cost-of-living adjustment (COLA) "to ensure that the purchasing power of Social Security and Supplemental Security Income (SSI) benefits is not eroded by inflation. It is based on the percentage increase in the Consumer Price Index for Urban Wage Earners and Clerical Workers (CPI-W)". The use of CPI-W conflicts with this purpose, because the elderly consume substantially more health care goods and services than younger people. In recent years, inflation in health care has substantially exceeded inflation in the rest of the economy. Since the weight on health care in CPI-W is much less than the consumption patterns of the elderly, this COLA does not adequately compensate them for the real increases in the costs of the items they buy. In 2009, the US CPI fell for the first time since 1955. Because of some shortcomings of the CPI, notably that it uses static expenditure weighting and it does not account for the substitution effect, the PCEPI is an alternative price index used by the Federal Reserve, among others, to measure inflation. From January 1959 through July 2018, inflation measured by the PCEPI has averaged 3.3%, while it has averaged 3.8% using CPI. ^ Education 2020 Homeschool Console, subject Economics, lecture "Inflation". Formula described within. ^ "Frequently Asked Questions about the Chained Consumer Price Index for All Urban Consumers (C-CPI-U)". Consumer Price Index. Bureau of Labor Statistics. Retrieved April 11, 2013. For example, the CPI-U for the years 2004 and 2005 uses expenditure weights drawn from the 2001–2002 Consumer Expenditure Surveys. ^ a b Robert, Reich (April 4, 2013). "What's the 'Chained CPI,' Why It's Bad for Social Security and Why the White House Shouldn't Be Touting It (VIDEO)". Huffington Post. Retrieved April 11, 2013. ^ Hobijn, Bart; Lagakos, David (May 2003). "Social Security and the Consumer Price Index for the Elderly". Current Issues in Economics and Finance. Federal Reserve Bank of New York. 9 (5): 1–6. Retrieved April 11, 2013. ^ Frum, David (2000). How We Got Here: The '70s. New York, New York: Basic Books. p. 324. ISBN 0-465-04195-7. ^ a b c d e Losey, Stephen (31 December 2012). "Chained CPI proposal off table for now, lawmakers say". Federal Times. Retrieved 3 January 2013. ^ Gibson, Ginger (April 9, 2013). "Republicans applaud chained CPI in Obama budget". Politico. Retrieved April 11, 2013. ^ "The Fed - What is inflation and how does the Federal Reserve evaluate changes in the rate of inflation?". Retrieved 9 September 2018. ^ PCE and CPI indices, Jan 1959 - Jul 2018: "FRED Graph - FRED - St. Louis Fed". fred.stlouisfed.org. Retrieved 9 September 2018.